A tank style blotting sytems for reliable and efficient molecular transfer of even "hard to transfer" compounds. This tank style electroblotter provides reliable and efficient transfer of a wide range of protein coumpounds from acrylamide gels. 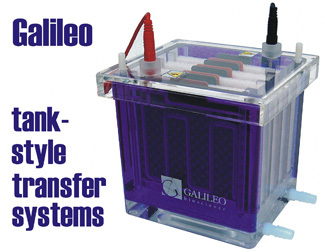 Up to four gels can be transfered simultaneously. Platinum grid style electrodes and robust construction assure even and complete molecular transfer and long service life. System is supplied complete with power leads and four blotting cassetes. Also included is a sample pack of our ultra-pure cotton fiber filter paper. High Desert buffers offer great reliability, convenience and price.